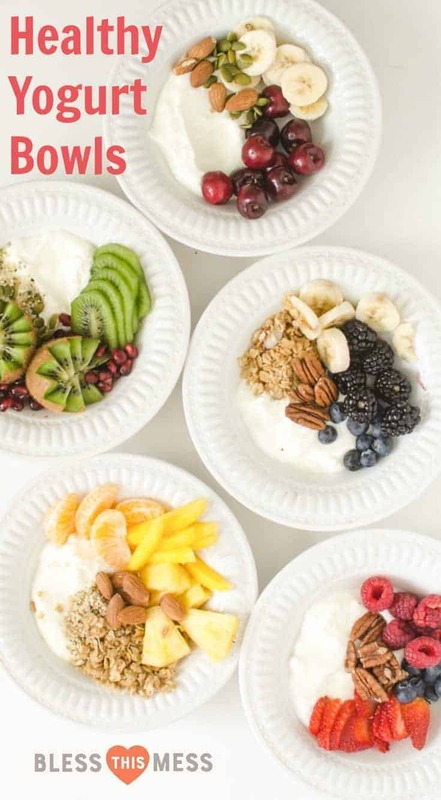 These 5 quick, simple, and healthy yogurt bowl ideas are packed with nutrition and will help you get excited about eating a healthy breakfast (or snack!). I love starting off my morning with a healthy, hearty breakfast and I think it’s so important to get my kids well-fed in the morning so that they are ready to learn, grow, and explore in their day. 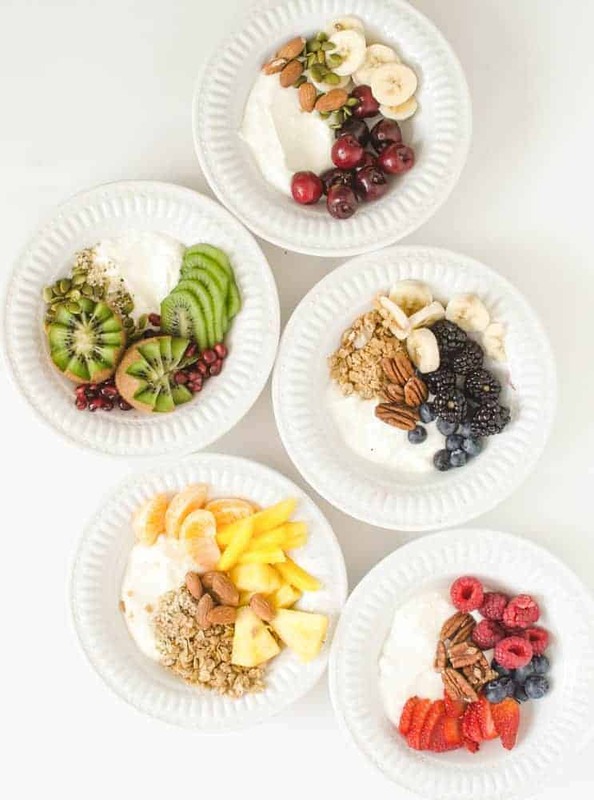 Healthy yogurt bowls are one of my very favorite ways to encourage healthy eating in the morning and today I’m sharing five recipes to get your breakfast ideas flowing. I have found that when I have a great morning, it leads to a great day. I try to start my mornings early before the house wakes up and spend some time reading, praying, writing, and then working. Getting the kids up and moving and serving a healthy breakfast is always next on the list. When I can start my day like this, I’m more likely to have a good, centered, healthy day moving forward. Simple, healthy yogurt bowls are one of my favorite quick and easy breakfasts that are high in protein, healthy fats, and fiber, but are low in simple carbs and extra sugar. Just what our minds and bodies need. I love to serve this meal as a DIY buffet. I’ll cut up assorted fruits and place them on a plate, put out the yogurt, and then fill up a muffin tin with a small amount of additional “extras”. I’ll add my nuts, seeds, granola, and anything else that I might have to the cups of the muffin tin and then my kids can dish up what they like. This is a great way to use seasonal fruit! If what you love isn’t in season, feel free to use frozen fruit. It’s just as delicious! I serve unsweetened yogurt and if the kids think they need a little something extra, I’ll give it a drizzle of honey or maple syrup. 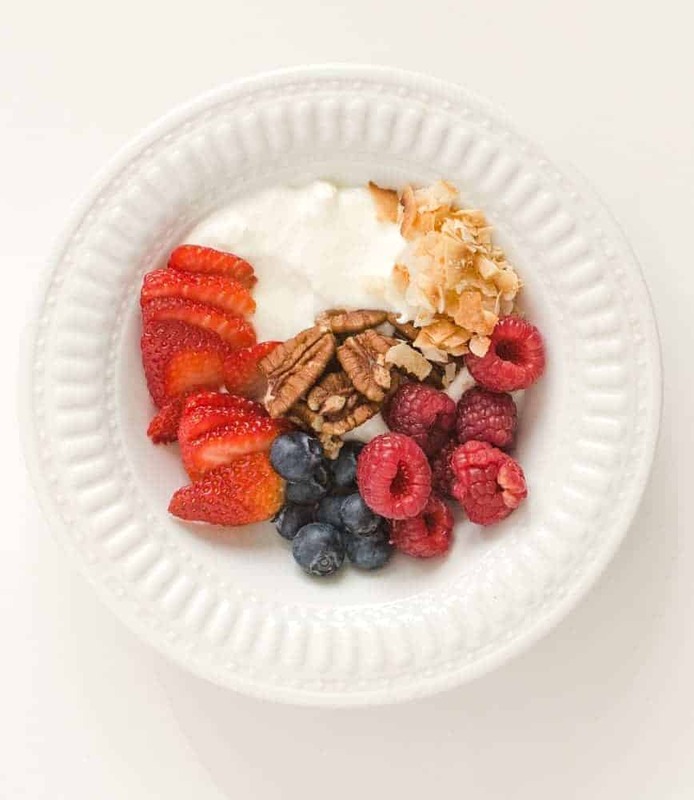 The fruit and extras add enough sweet to the whole dish that sweetened or flavored yogurt isn’t necessary. I like to use plain Greek yogurt for our healthy yogurt bowls (here’s how I make my own yogurt in the slow cooker). You can use whatever yogurt you like, including non-dairy yogurts like coconut or almond milk yogurts. If you are new to buying “specialty” ingredients (that are so nutrient dense and good for you! ), I’d suggest looking for them in the bulk bins of your local health food store. That way you can try a little without committing to a whole bag. I also have good luck with buying nuts and seeds at Costco, online at Nuts.com (they have tons of stuff including the unsweetened coconut, all of the nuts, and freeze-dried fruit, which is a big treat in this house). Amazon also has lots and lots of food items. 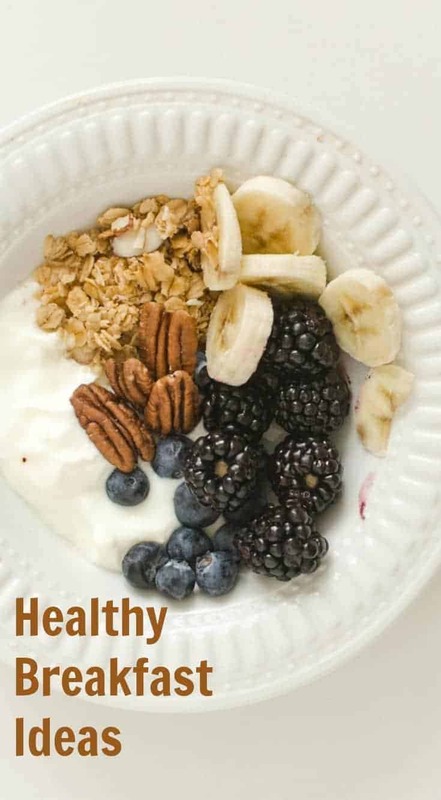 I’ve included some of our favorite healthy yogurt bowl topping combinations to give you some ideas. 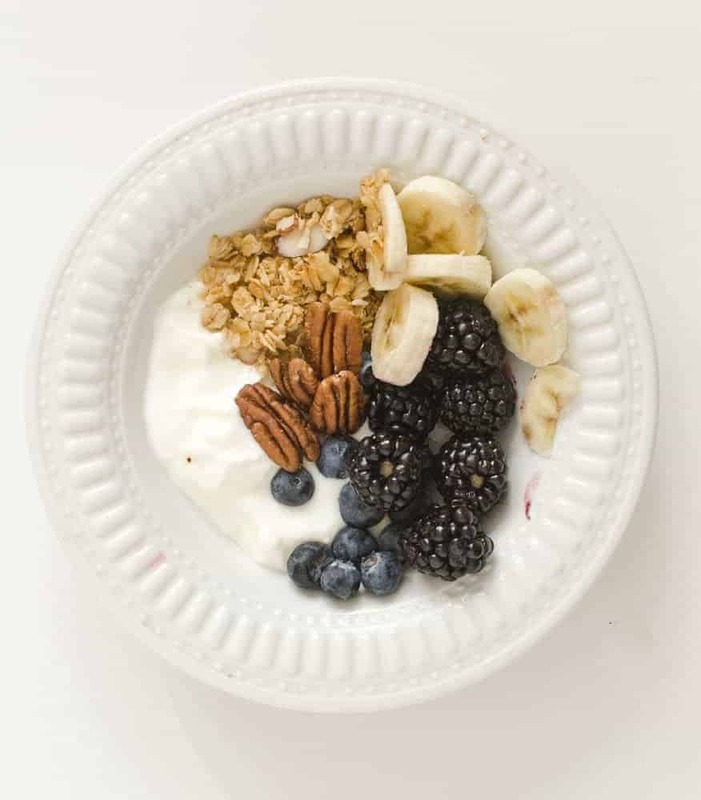 Of course the possibilities are endless – there are so many different ways to make a great yogurt breakfast bowl. 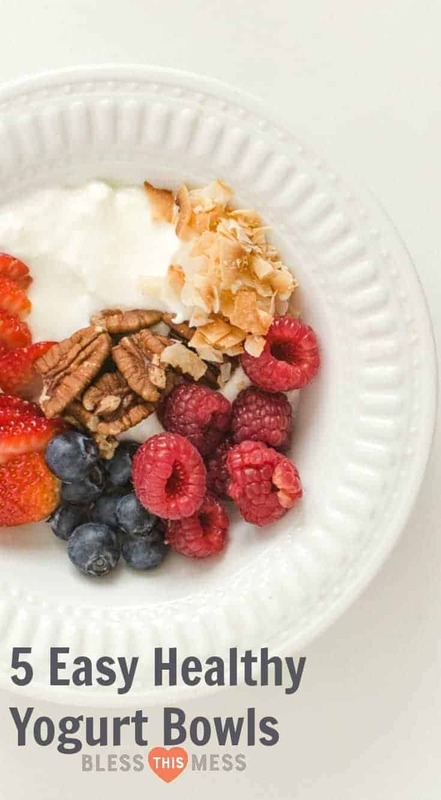 The one above is a very berry bowl made with plain Greek yogurt, pecans, toasted unsweetened coconut, strawberries, blueberries, and raspberries. In a small serving bowl dish one serving of yogurt. Top with your favorite fruit, nuts, seeds, granola, and additional toppings as you like. Top with sweetener as needed. I like to place the fruit/toppings/extras in a muffin tin so that my kids can easily scoop out what they like onto their yogurt. 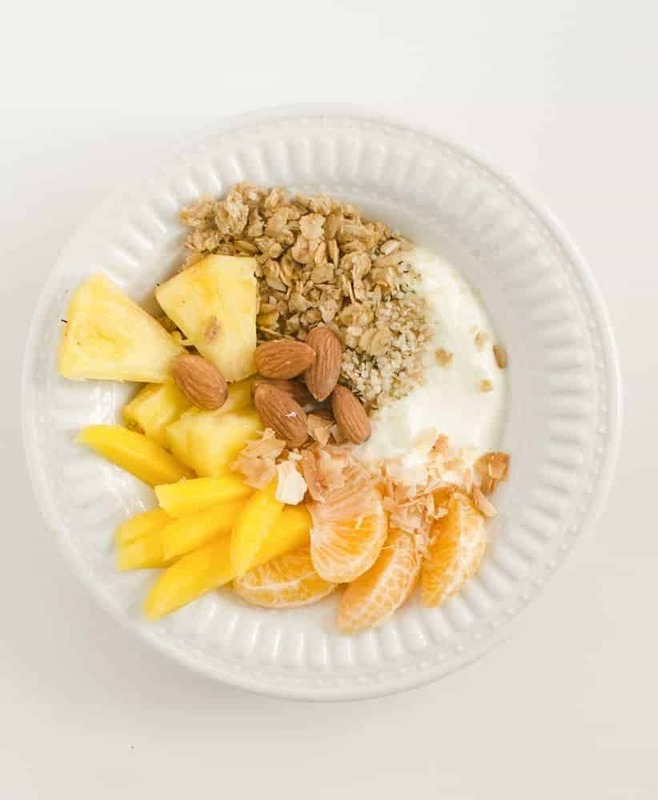 This yogurt bowl is a sunshine tropical bowl made with plain Greek yogurt, sliced pineapple, mango, Mandarin orange segments, whole almonds, my favorite homemade granola (it’s naturally sweetened and super easy to make), toasted unsweetened coconut, and hulled hemp seed hearts. 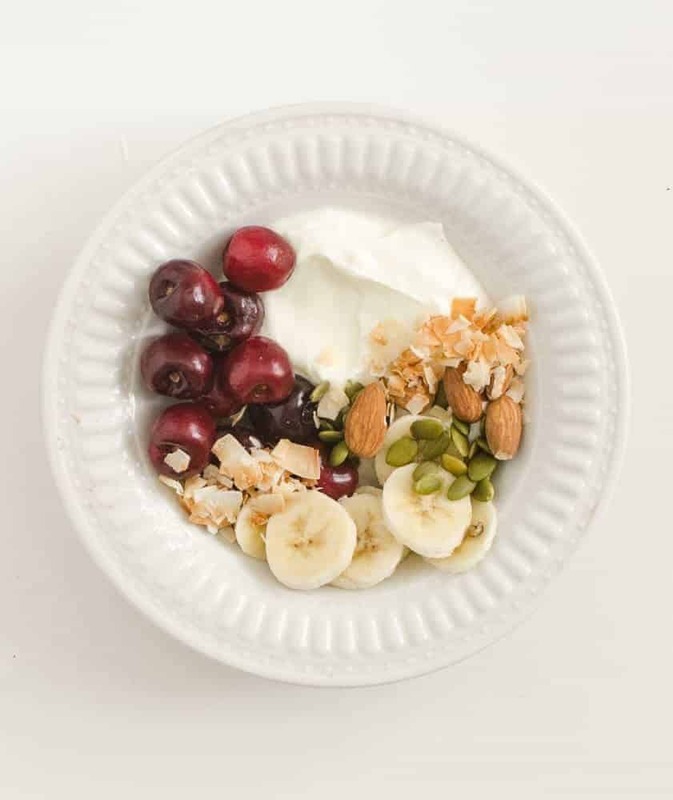 This bowl has a base of plain Greek yogurt topped with whole cherries (no need to pit…), bananas, toasted coconut, pepitas (hulled pumpkin seeds), and almonds. The banana is a great inexpensive way to add some natural sweetness to the bowl. This is my kids favorite combination! Unsweetened Greek yogurt topped with whole pecans, blueberries, blackberries, banana, and homemade granola. It’s sweet, it’s pretty, and it isn’t fussy. They also really like chia seeds. They add them to the top and call them sprinkles. 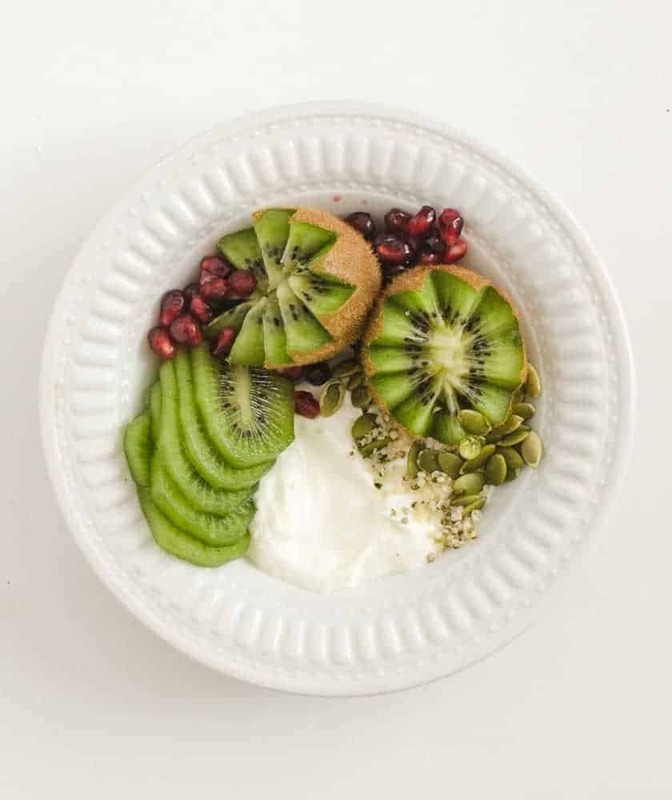 And last but not least, a Green Goddess yogurt bowl that has plain Greek yogurt, kiwi, pomagranate, pumpkin seeds (pepitas), and hulled hemp seeds. Seriously though, how pretty is that? I didn’t do the nutritional breakdown for these since they will vary so much depending on your yogurt and what you add to them. If you are intentional about what you are piling on that yogurt, though, you are really coming out with a super food powerhouse that is naturally sweetened, full of fiber and fat, and filling. Have I convinced you to try these yet?! There you have it! 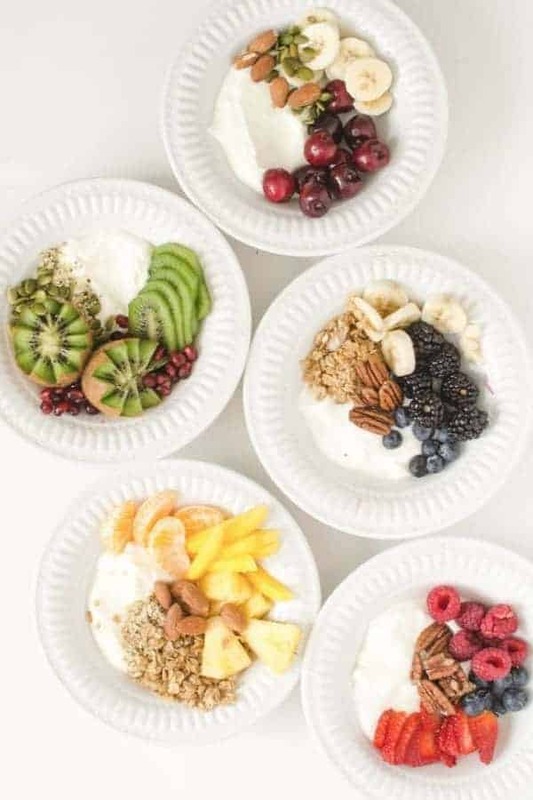 Some super simple but deliciously healthy yogurt bowl ideas that will keep you full and making good choices the rest of the day. This looks like a great way to start the day! I love all the different combinations.